There is no better venue to keep up with the latest audio visual technology than at the InfoComm 2013 Show. The educational seminars were outstanding and the latest technology was offered by manufacturers from all over the world. If you didn’t make the show this year, I will try to highlight some of the more interesting offerings. An important part of a projection system is the screen; and in today’s diverse use of projection, screen flexibility is important. 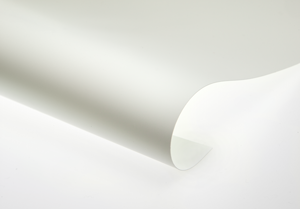 Draper introduced a semi-rigid acrylic screen, which can be used for front or rear projection, and can be curved to a specific need, or installed flat. Draper’s semi-rigid acrylic screens can be rolled for easy transportation, or to fit through a standard door. 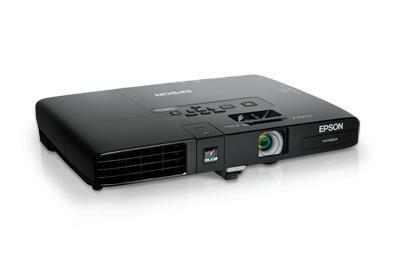 Epson introduced the PowerLite 1700 series of business projectors. The models are super-sleek at 1.7” tall, and are as light as a laptop at less than four pounds. Using the Epson iProjection™ App, a road warrior can wirelessly project presentations, photos and documents from mobile devices, while travel light without sacrificing image quality. There is nothing uglier that speakers hanging everywhere throughout the house or office. Stealth Acoustics gives you dynamic full range audio placed where you want, without regard to the architectural conflicts that occur with conventional speaker grilles and boxes. Stealth Acoustics has reconfigured its award-winning invisible speaker technologies and installed them into a thin, on-wall speaker package, with a completely flat-front radiating surface that can be finished in a wide array of options. The Image Wrap™ model includes high resolution images, from their artist’s gallery or a customer’s photo, that are factory laminated to the speaker face in a “studio wrap” style that turns the speaker into a work of art. Wavien, Inc. from Valencia CA has developed the Recycling Light Technology (RLT™) for increasing brightness of LEDs used in digital projection. The brightness increase mechanism can be used to conserve energy by lowering the power consumption while satisfying the same brightness specifications. This is especially important for battery-powered projectors where battery life is very important. This technology equates to an energy saving of 25% to 65% or an increase in battery life by 30% to 280%. Traditional light collection optics platforms do not increase the brightness of the LED and as a result, are not efficient for projection. dnp Denmark introduced the dnp Supernova STS unique front projection screen with a built-in Fresnel lens structure. This is an optical technology that is used to focus projected light, optimizing the output of Ultra-Short-Throw-projectors. Supernova’s unique combination of technologies actively enhances both image contrast and brightness, which produces up to seven times the contrast and double the image brightness of traditional front projection screens. The screen produces more vivid colors along with more detailed images. With Supernova’s increased brightness, a small projector will work well with the screen. Presenters have a unique set of issues when they have to connect to a projector, and sometimes it’s not easy. Mitsubishi Electric Visual Solutions America, Inc. launched their Cloud Projectors, making connecting to content really easy. Users now have the option to simply log on to the network, get immediate access to their files located on their backend server, and begin presenting to their audience. The Mitsubishi WD390U-EST WXGA DLP Cloud Projector can also connect to a number of mobile apps, allowing presenters to use their phone, tablet, or other smart device instead of a laptop or other connected computer. Leon Sound one-ups itself with a piece of art that would suit a museum or music hall or the living room of anyone who loves the museum or the music hall. The six foot by eight foot sound sculpture from Leon Speakers has multicolored LED lights. Because the slats vary in depth and shape, the sound changes as you walk by. The sound stage is so interesting because of the way it disperses naturally. The company’s mission is to make art with audio. Speakers are cool again. Expect to put out $16,000 – $25,000. Imagine being able to access, present and share information in mere seconds during a presentation, rather than having to go through the difficulty of powering up the PC, logging in, and accessing the network. When the meeting is over, there’s no logging out, no system updating to wait on and all files are instantly purged so there’s no chance of them being left on the machine or accessible to someone else. With AMX’s new Enzo, a presenter walks into a meeting room, touches any button and the presentation is on. There are no extended boot times or PC logins. 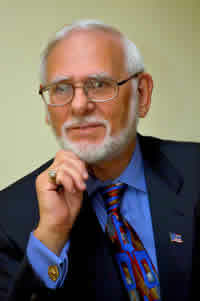 The presenter locates the presentation content from a drop-box, the Web, or USB, since the content lives in the cloud, not on a phone. The presenter then opens a file and starts the meeting without delays. Since others might want a copy of the presentation materials, attendees can scan the QR code on the screen to get the presentation and other files. In addition, the presenter can control the lights, volume, etc., right from enzo. Does your projector occupy the center of the table, tangling people and papers in its cords and noisily blowing hot air into your audience’s faces? Not if the projectors are from Ricoh, which has a new line of projectors that uniquely rest at the edge of the table with the wires, vents and light directed away from attendees, leaving the center of the table clear for business. Ricoh is the only projection system manufacturer to offer fan and cable connections on the lens side. Its breakthrough auto brightness function dials brightness up or down depending on ambient light, prolonging lamp life and conserving electricity. Networked models, which both support wireless and wired connections, can be managed by Ricoh's Remote software to further minimize energy consumption. A built-in 10-watt speaker system provides impressive audio for larger corporate settings, all though the projector is barely the size of a business letter. I usually don’t concentrate on one type of product offered at InfoComm, but there appears to be many new innovations in projectors this year. Sony's next-generation projection technology is based on a laser light source. 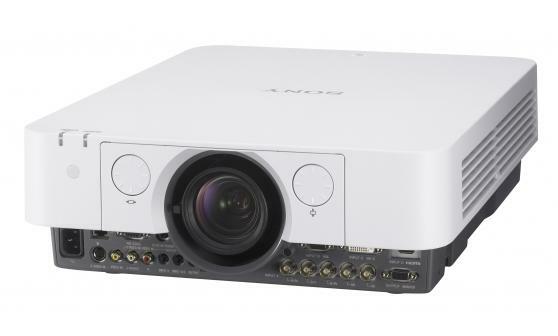 Their new model, VPL-FHZ55, is Sony's first lamp-less projector to use 3LCD imaging technology and achieve 4,000 lumens of light output at WUXGA resolution, to deliver bright and vivid color reproduction. The new projector uses blue laser as its light source, which excites a phosphorous material that in turn creates white light. The white light is delivered to the 3LCD optical system, generating vibrant RGB color through a color splitting process. The VPL-FHZ55 projector offers virtually maintenance-free operation for up to 20,000 hours from the light source, display device and filter use. The mercury free projector is packed with energy-saving features, including auto light dimming, auto brightness adjustment, and constant brightness mode, which allows users to maintain brightness throughout the expected 20,000 hour life by driving the projector at reduced light output. One big plus is by using a laser light source the projector has instant "on/off" capability. You no longer have to wait for the projector to cool down. If you are in the market for a new projector, I suggest that you take the time to check out the many new innovations before plopping down your hard-earned cash. The tables are constructed with furniture grade laminates and edge banding with rectangular top with rounded edges. It has openings for access to controls and cable connections with a locking lower compartment for the computer. It comes with ventilations and casters. I can’t do justice to the many new products featured at the InfoComm Show. I suggest that you go here and investigate the type of product that you are searching for.